Place the sugar in a saucepan with the butter on top. Heat on the hob until the sugar caramelises, using a whisk or wooden spoon to bring the mixture together. Remove from the heat once the caramel has turned a rich toffee colour and pour into an 8 inch (20cm) cake tin or ovenproof frying pan. Arrange the plums skin-side down in the caramel. It doesn’t matter if it starts to set. Roll out the puff pastry to a thickness of about 1/8 in (3mm), making sure you have enough to cover the pan and leave a one inch (2.5cm) overlap. 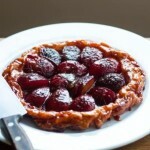 Cover the pan with puff pastry and tuck the overlap down between the plums and the pan to form the tart’s outside crust. Pierce the top of the pastry once. At this stage you can place the tart in the fridge until you’re ready to bake it. Remove, allow to cool slightly and placing a large plate or tin tray over the top of the pan. Carefully turn the pan over and allow the Tart to drop down onto the plate. 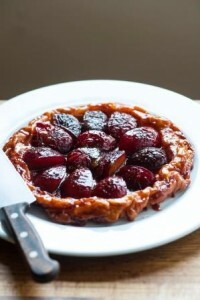 If the caramel has started to set, you may need to ease the Tart out with a palette knife.